Once again, back from blogging after a long hiatus due to school. This may have to be a periodic phenomenon but don’t worry, this blog isn’t going anywhere. Back in February I commented on the oft-asked question “Can Video Games Be Art?”. I was reminded of this question again earlier this month upon hearing that Irrational Games – the studio behind the infamous Bioshock series – was closing down shop. Apparently, the move was motivated by lead producer Ken Levine’s desire to retire from mainstream game development in order to focus on smaller art-house video games. It seems that Levine counts himself among the many contemporary designers who see small-scale independent games as the means by which video games can establish themselves as capable of being truly artistic. Given my skepticism that video games can ever really communicate artistic ideas, some commentary seems necessary. I loved Levine’s Bioshock but it was his franchise, more than any other, that convinced me that video games could never really be art. But first, some history. Bioshock was a 2007 first person shooter (fps) game set in a gothic underwater city. However, there was a twist. The dystopian metropolis in which the player found himself was none other than the ashes of Ayn Rand’s imagined utopia of ultra-entrepreneurial supermen. What followed was a bizarre mixture of survival-horror, psychological thrills, and political commentary ending with a dark turn that has had critics and fans singing its praise ever since. But this wasn’t the end of the franchises’ success. 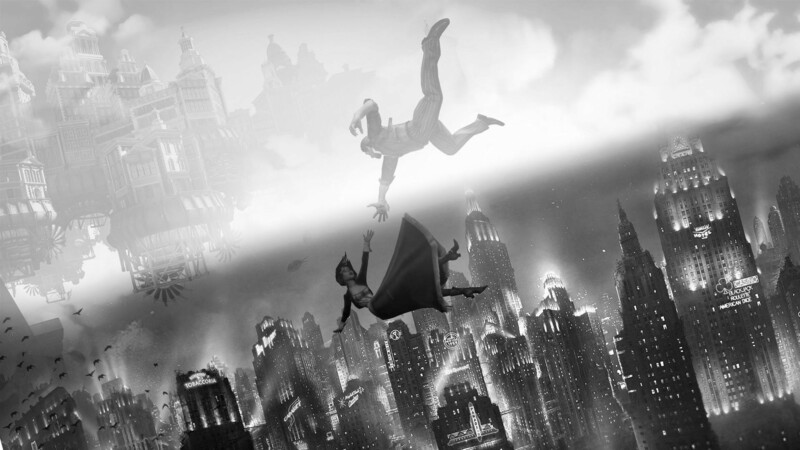 The original Bioshock was followed in 2013 by an even more critically acclaimed sequel – Bioshock Infinite – which incredibly justified its hyperbolic title by adding an existentialist tilt to its social commentary. By linking its broader plot of existential doom to a pair of well developed characters, Bioshock Infinite seemed to exceed its predecessor in scope and storytelling. The game pushed the envelope in all dimensions showing that original and creative worlds could be used to present a tragic and challenging story to audiences. But at the height of the Bioshock’s critical and popular success, the foundations of Levine’s creation were creaking. In fact, the very success of Bioshock Infinite exposed many of the limitations inherent to the medium. Most obviously the game’s the First Person Shooter format (FPS) ( a format, which worked well in the original Bioshock) seemed horribly out of place in a more sophisticated story. It was one thing to use violence liberally in the Gothic horror environment of Bioshock’s underwater dystopia. It was quite another for such violence to be the driving force behind a character-driven story about personal redemption. . The critics were quick to catch the jarring discontinuity between the game’s aspirational plot and its casually gruesome gameplay. Some fans seemed almost viscerally offended and as Bioshock Infinite grew in popularity its problems crystallized into an all-out backlash. Hindsight is 20-20 and the internet was fast to come up with a laundry-list of ways by which the gameplay might have been designed in a more tasteful, thematic, and intelligent way. However, despite the much-discussed shortcomings, it was obvious from the onset that there was really no way to make a game like Bioshock Infinite without many of its flaws. Games are expensive, more expensive than movies ( just imagine having to spend hundreds of hours with an AI to stop your lead actress from staring off in random directions like a robot). In order to get the multi-million dollar budget with which to hire artists, designers, animators, and talented voice actors necessary for such such ambitious project, the game needed a large ready-made audience. For a market still dominated by young men this meant big guns, big action, and big violence. From this perspective Ken Levine’s eventual decision to shutter his production company in order to shift focus onto to small scale independently funded games makes a great deal of sense. The problems, inherent in games like Bioschock Infinite might at once be solved with a smaller audience only interested in narrative appeal. Levine was sensitive to critics complaints, and certainly the easiest way to rectify the problem was to find an audience more interested in art than violence. But I remain skeptical. 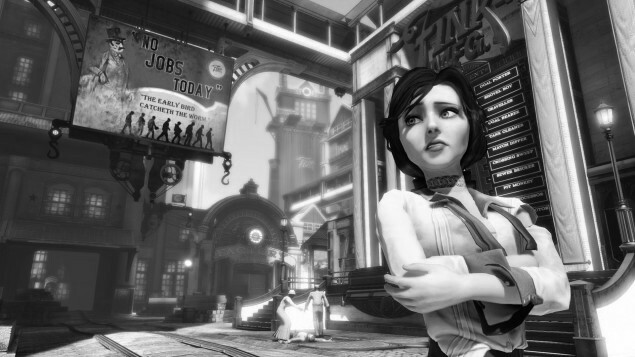 The studio’s desire to produce something marketable as a game was not entirely irrational (no pun intended) and the conflict between gameplay and narrative structure that plagued Bioshock Infinite was really less the classic “auteur” versus “deep-pockets” conflict and more an indicator of the inherent difficulties of turning any game into what might be classically called “art”. Although there are trade-offs in any media, video games are uniquely constrained in ways that movies and books are not. This primarily has to do with the fact that video game audiences are, well, not audiences. Video games are games and games don’t have audiences. Games have players. This is a much deeper problem than having to appeal to a lowbrow and a highbrow audience simultaneously. The critic who analyzes The Empire Strikes Back in light of Joseph Campbell and the hoi-polloi who watch it for the cool explosions are still participating in the medium in the same way. The same cannot be said for a video gamer trying to crank-out shooting achievements in Bioshock and an audience member trying to absorb its story and theme. Even in classic games like Chess, as a player grows in appreciation of the game the allegorical representation of the pieces as soldiers recedes into the background. The experience of an audience and a player are not only different, they are fundamentally opposed. One can see this problem even in independently-funded games where issues over creative control are less prominent. Here, once again, critically acclaimed narrative schemes (such as last year’s Gone Home or Kentucky Route Zero) often leave players feeling cheated by a non-existent gaming experience. Even most of the popular indi-games like Braid or Limbo seem like copies of their corporate counterparts with some post-modern veneers tacked on to make the experience more deep. Some argue that independent games have led to a number of different approach to gameplay and story-telling, but in my experience these are marginal victories at best. Of course, I am not the first person to bring this up. Roger Ebert mentioned similar problems in his famous take down of the “games are art” concept several years ago. However, while Ebert’s analysis was intended as a dismissal of the medium, the problem is becoming more tragic as one sees video games telling more compelling stories than most mainstream movies. We all want artists like Ken Levine to succeed in finding a ways to express themselves, but the limitations inherent in the medium may make this effort ultimately futile. In fact, Bioshock’s greatest moments were when it broke the fourth wall and critiqued the limitations of the player’s role in the story. But this in itself was a weakness. It’s one thing to use a game’s narrative limitations to critique free will, but eventually audiences are going to demand an experience that is not so self-referential. There is a trade-off. A game creator must make a choice in favor of his players or his audience and there is really no way to get around the consequences. Every attempt to shift the gamer out his role as a player and into a role as a critic will diminish the gaming experience. Every attempt to buff the complexity of the game mechanic hurts the narrative structure of the story. Here I am reminded strangely enough of a conversation from Austen’s Pride and Prejudice in which Caroline and Mr. Bingley are discussing dancing. Austen provides the critical insight. It would be much more artistic if narrative and storytelling were made the order of the day in computer entertainment, but then this would not be near so much like a video game.